Learning the basic skills of psychiatric assessment, acute management, rapid return to the community and/or referral, is central to the PGY1experience, which is divided into four segments. 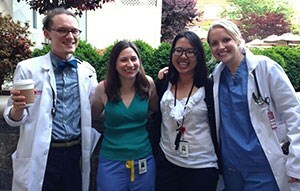 PGY 1 residents spend 2 months on rotation in the Psychiatric Observation Suite (POS). The POS is a five-bed crisis intervention service within the general Emergency Department at the Moses Division of Montefiore Medical Center. The Emergency Department is not only consistently ranked as one of the busiest emergency services in New York City, but recently was reported to be the second-busiest emergency department in the nation. Patients are evaluated in the POS or as a psychiatry consult in the medical or pediatric ED. This rotation offers an incomparable education in emergency psychiatry and crisis intervention and allows residents the opportunity to perform comprehensive evaluations, initiate treatment, observe patients, and/or refer them to community resources or for admission. Intensive, on-site supervision by attendings is provided days and evenings. During a 4 month rotation on the inpatient psychiatry unit (Klau 2), PGY 1 residents experience a multidisciplinary treatment team model, where they are either the assigned primary therapist for acutely hospitalized patients, or the medical back-up for psychology interns and medical students. The large multicultural community served ensures a rich immersion in severe psychopathology of all major syndromes with culturally sensitive evaluation, case formulation and treatment planning. In addition, patients may have comorbid medical problems and /or neuropsychiatric conditions. Klau 2 is a locked 22 bed psychiatric inpatient service at Montefiore Medical Center, where the patient population ranges in age from late adolescent to geriatric, and the average length of stay is two to three weeks. The service’s overall approach is to perform a psychiatric and psychosocial evaluation, establish a working diagnosis, and provide immediate pharmacological, psychological, ECT, and milieu treatment, with the aim of returning the patient to the family and community as soon as possible. While working on the service, residents are intensively supervised by one of three full time attending psychiatrists assigned to the unit and are provided close and supportive supervision as they develop new skills and competence in psychopharmacology, individual, group and family therapy. There is a required four month rotation in medicine or pediatrics, which is conducted under the auspices of the excellent Departments of Medicine or Pediatrics at Montefiore Medical Center’s Weiler and Moses Divisions. During this rotation, the residents' three months of inpatient experience is complemented by a month of adult outpatient work in a community ambulatory medical clinic. Completing the requirements of the first year, PGY 1 residents also spend two months in neurology at Montefiore’s Moses Division working on both the neurology inpatient and consult services.